A large number of Cherenkov detectors operating in individual EAS events and the comparison of experimental data with QGSjet model results allowed us to obtain estimations of average mass composition of primary cosmic rays. 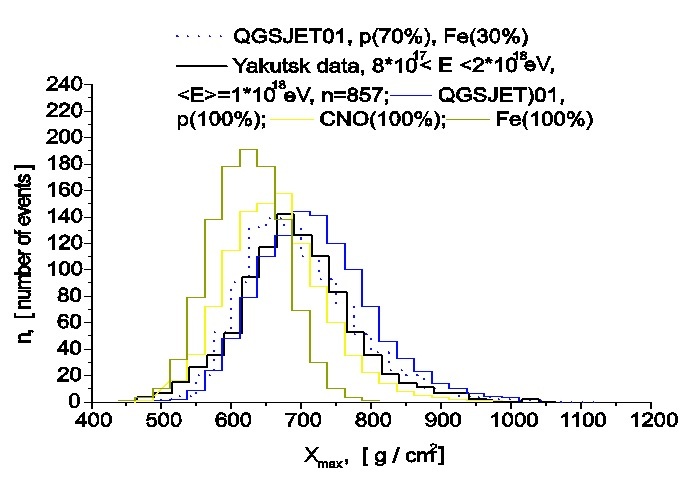 For this purpose we have compared Xmax distribution (an example is given in Fig.1 for the energy interval 0.8-2 EeV) derived from the measurement of lateral distribution slope of Cherenkov light intensity on the ground, and predictions of the QGSjet model for different primary nucleus. The optimal primary mass composition (supposed consisting of 5 nuclei groups) which minimize chi-square deviation of the model distribution from observed one is given in table in three energy intervals. In the framework of QGSjet model one can conclude that the average mass composition of cosmic rays changes with primary energy. At E~1 EV the PCR flux consists of ~70% protons and helium nuclei, while it reaches ~80% above 5 EeV. Another possibility to infer the mass composition of PCR is to use the muon component measurements in EAS. In this case we have selected showers with E≥1 EeV and zenith angles θ<600. The shower axes are within the array area and not less than three muon detectors have nonzero responses in a particular shower event. 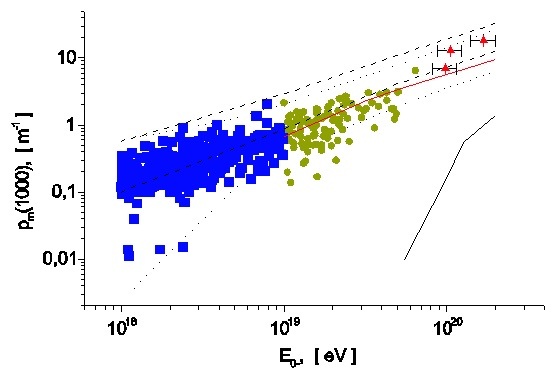 The muon density at distance 1000 m from the shower core is analysed as a function of primary energy (Fig. 2). In Fig. 2 the experimental data are given in the energy intervals 1-10 EeV (squares), 10-100 EeV (circles) and 100-1000 EeV (triangles). The QGSjet model calculation results are shown by dotted line (primary proton, ±1σ) and by dashed line (iron nuclei). Solid lines (red and black) show the upper and lower limits in the case of photon origin EAS. The conclusion can be drawn, confirming one given above, that air showers at E≥3 EeV are formed mainly by light nuclei with the pronounced fraction of protons and helium.